The Wisconsin Dells’ popularity has surged in the past decade, filling resorts to capacity with children eager to take on any waterslide in sight. 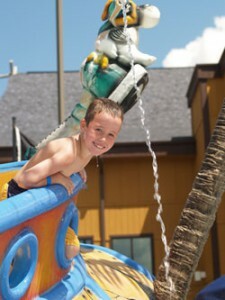 Explore all the things to do and places to stay in Wisconsin Dells – “The Waterpark Capital of the World!®”. The Dells may be world-famous for their waterparks, but that isn’t the only reason to visit the Dells. As one of the most popular Wisconsin vacation spots, there are many other reasons to love the Wisconsin Dells this time of year. Like live entertainment, thrilling attractions, lux to cozy accommodations, and dining options to please any palate. Oh, and let’s not forget the waterparks! But the best part? There’s always more around each and every corner. Start planning your getaway today! Sanctuary Lodge at Splash Canyon formerly the Polynesian Resort Hotel is the best Water Park Hotel for Families with kids 10 and Under! The resort opened the first indoor waterpark in United States’ in the Dells area in 1994. It has since increased its size of indoor and outdoor parks to over 200,000 sq. feet. Included is over 4 acres of outdoor waterpark featuring waterslides, lazy river, interactive pirate ship, basketball & volleyball pool, whirlpool’s, mushroom waterfalls, and kiddie interactive water play areas and kiddie water slides. Featuring the Temple of the Black Pearl offering thrills for the entire family. Drift through Blackbeard’s Dark Tunnel Mystery Voyage or enjoy the two-story body slides & tube slide, or let the little kids have a blast in our water factory with over 80 interactive water activities. Indoor waterpark includes 6 waterslides, 4 hot tubs, sauna, animated lazy river, water basketball & water creatures. From Memorial Day through Labor Day enjoy Over 4 Acres of Outdoor Waterpark areas which includes: Waterslides, Lazy River, Interactive Pirate Ship, Basketball & Volleyball Pool, Whirlpool’s, Mushroom Waterfalls, and Kiddie interactive water play areas and kiddie water slides.